Just because a meal is vegetarian or vegan, doesn’t mean it lacks flavour! 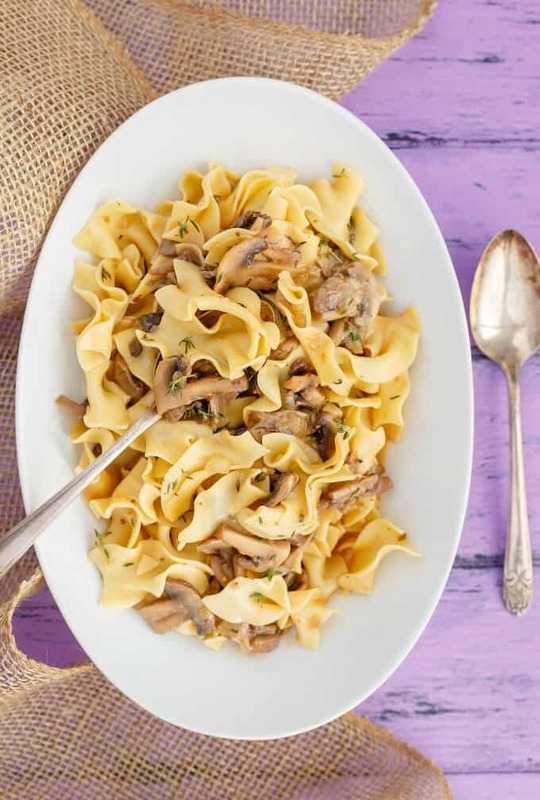 This mushroom stroganoff is packed full of flavour, and it is super easy to make! 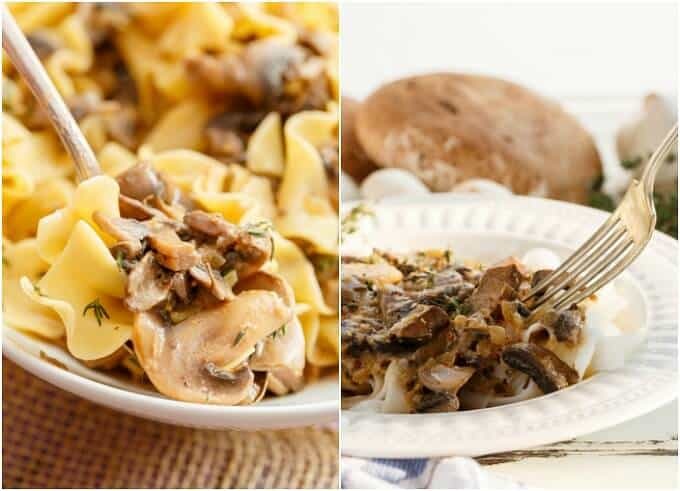 The photos for this vegetarian mushroom stroganoff have been updated as of January 30th, 2018! People think when it comes to vegetarian recipes that you need to include tofu as your meat substitute. Don’t get me wrong, I love tofu, but it is not necessary in every recipe. If anything, most vegetarian/vegan recipes can be made hearty and filling by adding lots of vegetables and protein fillers such as lentils and beans. One of my favourite meat substitutes are mushrooms. Whether portobello or button mushrooms, I love them all and I find myself using them more often in my vegetarian recipes. I absolutely loved this mushroom stroganoff. I cannot wait to make it again (it may be tomorrow.) It is just so easy, and packed full of flavours, all the while not being “too mushroomy.” Sounds weird, but sometimes I can get creeped out by too many mushrooms (or if my portobello mushroom burger is too thick.) And I feel this recipe is not too bad for you. For a not so stroganoff dish, you could omit the cream altogether. Hmm, if you do that and use olive oil instead of butter, you have a vegan recipe (obviously substituting in different pasta.) I am sure someone could play around with this to make it gluten-free, too. In a large saute or frying pan, add the butter and melt over medium-high heat. Add in the onions and cook for about 3-5 minutes. Stir in the garlic and cook for a minute, or until fragrant. Add the mushrooms , salt, pepper, and cook until the mushrooms are nicely browned, about 10 minutes. Stir in the tomato paste and cook for 2 minutes. Add the flour and cook for 3-5 minutes. This will result in your pan getting really dry, so stir frequently. Deglaze pan with the white wine. Cook for another couple of minutes, or until the wine has evaporated. Stir in the broth, coarse mustard, soy sauce, salt, and pepper. Bring to a boil and simmer for 10 minutes. Add in the fresh herbs and cook for a few more minutes. Remove from heat and allow to cool a bit before adding in the sour cream (it tends to look curdled when it is added too soon, but don't worry, it is perfectly fine.) Reheat if necessary. Cook pasta and stir in noodles. Serve with a garnish of fresh thyme! Greek yogurt or sour cream can be used here. If you are not a fan of either, you can omit them as the sauce is delicious on its own. Soooo, I totally used a 340g bag of egg noodles which is fine, but it soaked up a lot of my sauce. I would suggest around 1/2 lb pasta for a saucier dish, or the 3/4 of a lb like I did for less sauce. I still got a ton of flavour and really, it was still very creamy, but it left my pictures looking dry. Trust me, this was not the case but if you like lots of sauce, less pasta is necessary. Making the dish again, I loved the extra sauce and will definitely cut back on my pasta. Haha, unintentional meatless Monday post but seriously, soooo good! 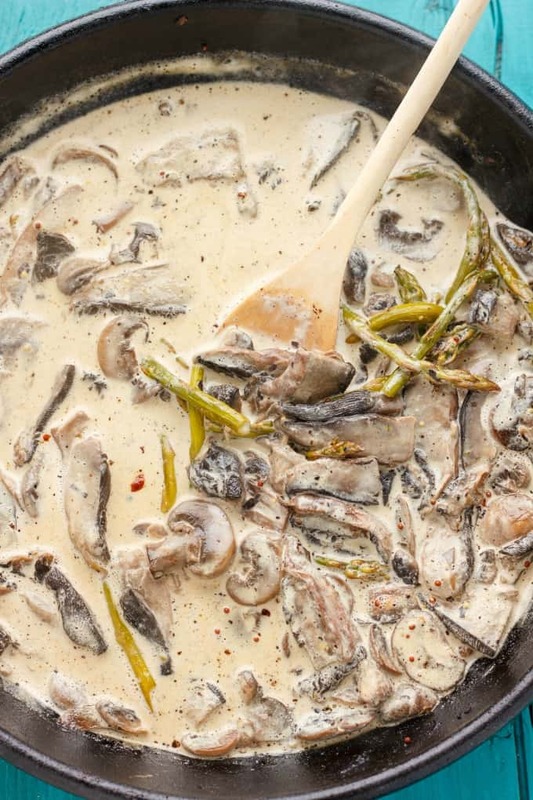 I am not a fan of the beef classic but this mushroom version sounds crazy good! The more sauce the better on my pasta! I prefer less dressings on my salad, but love more sauce on my pasta! WOW...that mushroom sauce looks AMAZING!! 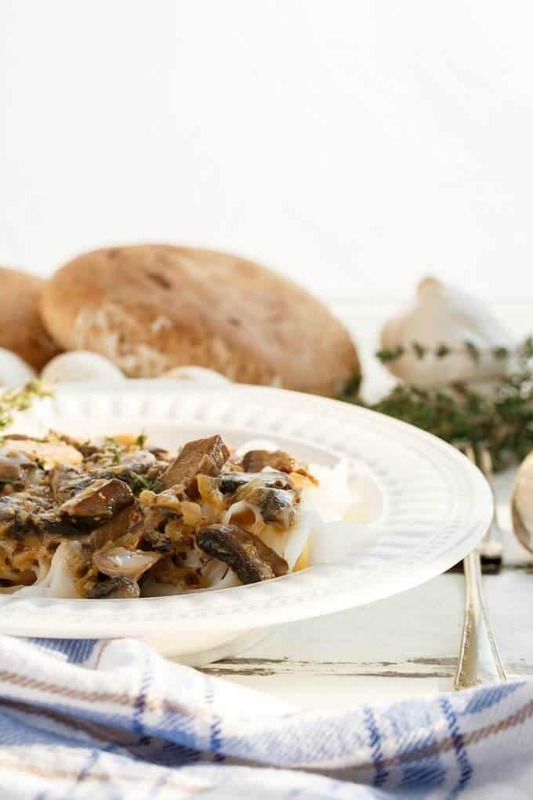 I'm a HUGE mushroom fan and stroganoff is no exception. Great recipe! I love stroganoff! Thanks for switching it up with a vegetarian version, yum! I love this recipe! I am not a huge meat eater and I know even my meat loving family would enjoy this meal! It is so true, mushrooms are my big meat substitute in my vegetarian lifestyle! oh my goodness.. i big puffy heart mushrooms! Can't wait to make this recipe! Sounds so comforting right now! Thanks, Krista! Mushrooms for the win! Beautiful stroganoff! I love the rich color of the sauce and that it's a way to go vegetarian! I almost felt like a monster mixing in the Greek yogurt because the sauce was so beautiful! this looks and sounds amazing. I don't blame you for polishing it off in two days. I'd do the exact same thing. Yum!!! I'm a huge mushroom fan, the more the better! This recipe looks so good, I'm going to forward it to my vegetarian son - I know he'll love it! I love how simple this is! And great for a Meatless Monday too! I totally love mushrooms! Stroganoff is a favorite around here. I am going to try this soon. Thanks for Sharing!! Thank you, Chandra. As others suggested, the mushrooms would be great even in the meat version! 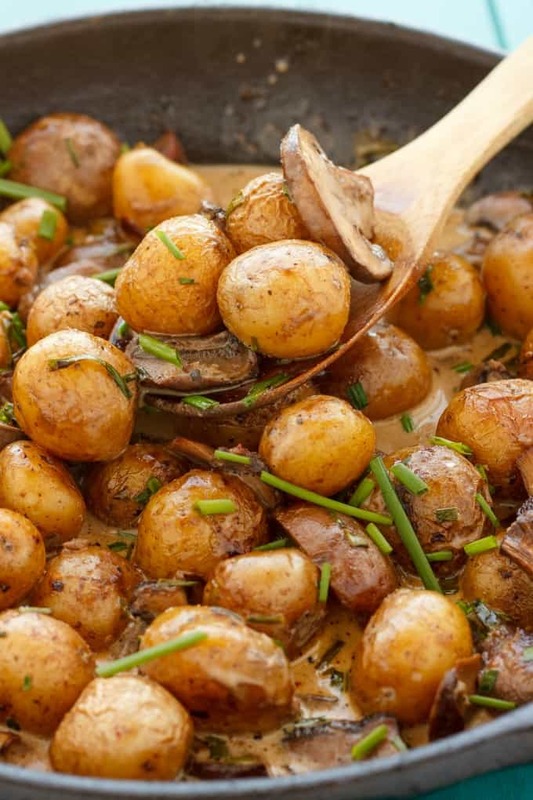 Mushrooms are such a great meat substitute. They have such a wonderful texture and I love their flavor. This stroganoff looks soooooo good! 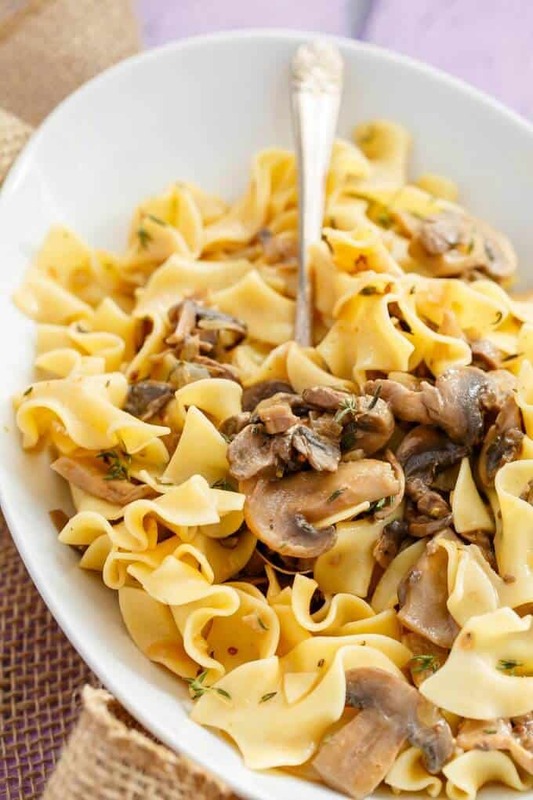 I find mushrooms probably one of the best meat substitutes and they work perfectly here! 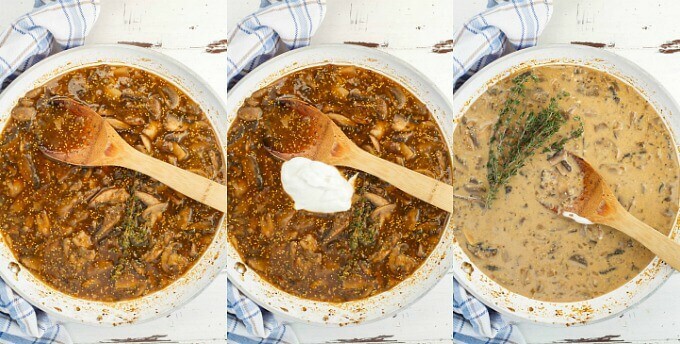 Not to be unladylike, but I would like to dive my face into a bowl of this stroganoff! Ahahaha, I will not judge! Kacey, I am seriously drooling here! That sauce just is too gorgeous, I think I could drink it. 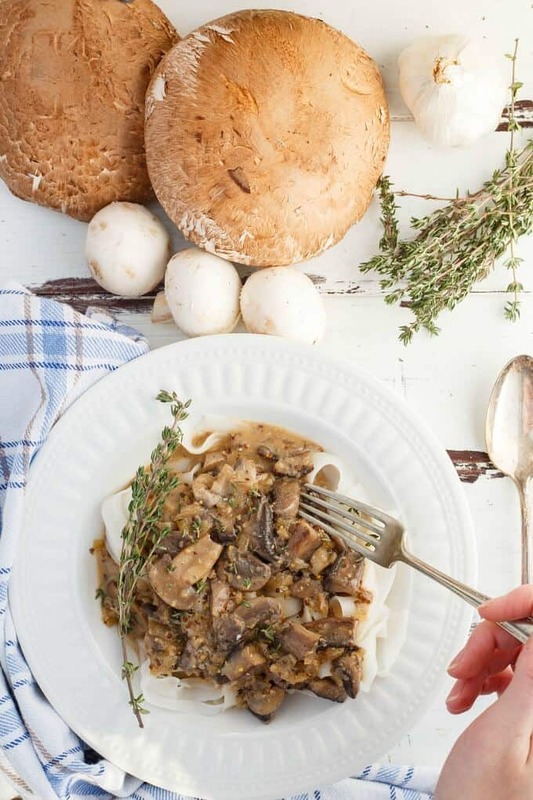 Beef stroganoff is one of those childhood comfort foods for me, but I adore mushrooms and am definitely going to have to give this a try for dinner soon. I love that you tried it with Greek yogurt and thought it tasted great that way, too! I am so happy you are happy, Ashlyn!! The mushrooms are a nice change from beef! What kind of mustard do you suggest? Beef stroganoff was a family favorite growing up but now I am a vegetarian. I absolutely loved this recipe. Made it last night for dinner and my boyfriend loved it too (he does eat meat). The portobellos add a nice meaty type texture. This is definitely one of my go to vegetarian dishes now. Thanks ! Woohoo! My husband is the same: he still eats meat but he really enjoyed this dish. Glad you were both happy! Made this last night! Was getting stuck in my regular 5 meals and wanted to try something new. I'm glad I did! The omnivore boyfriend requested that I add this into the rotation for sure. He loved it too!! Yes!!! Mushrooms are so meaty anyway, so I see why meat-eaters have no problem with this dish :) You have motivated me to revisit this! I just stumbled upon your site. This recipe was amazing! However, I am frustrated that I am not able to read others' comments. Not sure why they are not public. :-( I love reading them and they are are an important factor for me when deciding if I want to invest the time and effort in trying a new recipe. Made this dish last night and we loved it! I halved the recipe for the just the 2 of us. Only used White mushroom as it's what I had on hand and needed to use up. Went with beef broth and used regular sour cream, served over no yolk egg noodles. Love the whole grain mustard in the sauce - definitely added flavor. Can't wait to make again. Awesome to hear!! Thank you! I made this last night for me and my husband, and we loved it! I made it with beef broth instead of the vegetable broth. My husband loves beef stroganoff and is very critical, but he definitely approved of this recipe. I made his beef on the side since I don't eat meat. Very good. Definitely adding this to our list of dinner recipes. Great recipe - making it again tonight! I definitely think those two ingredients really help this dish :) Thanks! Made this tonight and oh my goodness! Delicious! Thank you for the recipe! Makes a vegetarian heart happy! I made this recipe tonight and we loved it. My meat-loving husband devoured two bowls and asked me to make it again. Didn't change a thing and it was perfect. Thank you! You have made my day! More like my year!! Lol. I am so happy you loved it! I just made it last week and hope to get some new pictures up. No one turns down this recipe here, even the biggest meat eaters :) Thank you! Just have to tell you how good this recipe is! Made it tonight & fell in love with it! Definitely sending a link for the recipe to family & friends.